What’s the worst thing about you? Can you relate? Let us know if we got it right! Aries (March 21 – April 19) He’s just all over the place but you probably knew that already going into the relationship. In fact, his impulsive and adventurous personality is probably one of the things that attracted you to him in the first place. While it can be exciting to be with him, it can also be incredibly frustrating. You never know what to expect when it comes to him and you crave some kind of structure and stability from him every once in a while. Taurus (April 20 – May 21) They are too stubborn for you a lot of the time. As Taurus men, they are naturally inclined to be hardheaded. They are difficult to reason with because they tend to be very close-minded. They aren’t very open to the perspectives and opinions of other people and so discussions with them can be downright brutal. Gemini (May 22 – June 21) You know it. You just wish there could be some depth there. 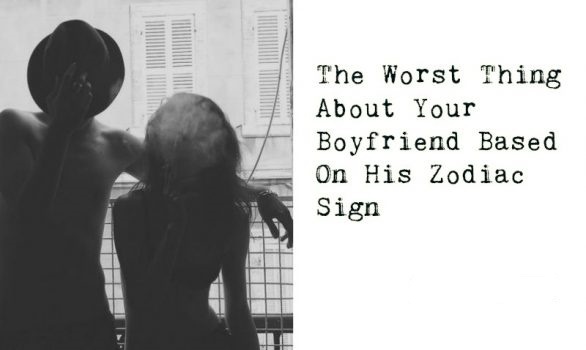 Your Gemini boyfriend has a tendency to be quite dense and there’s just no denying it. Not to say that he’s stupid or that he’s a complete imbecile, it’s just that he lacks a certain depth that is present in most interesting people. He’s a little too shallow and materialistic for you and you wish you could change that about him. Cancer (June 22 – July 22) It’s practically like taking care of an overgrown toddler when it comes to dealing with your Cancer man. He is a spoiled brat and he thinks he’s entitled to all of your love and care. The worst part of it is that you know he would just crumble and die if you weren’t there to help him out with things. He is incredibly dependent and he just doesn’t know how to take care of himself. Leo (July 23 – August 22) His arrogance and his pride are what really drives you nuts a lot of the time. Sure, his confidence is what made you fall in love with him. But his overconfidence can be very frustrating to deal with especially as you get deeper into the relationship. You wish he would display some humility every now and then. Virgo (August 23 – September 22) Virgo men are just absolute perfectionists. They have a tendency to want to control things all the time and it can be very suffocating to be around them. They aren’t very adaptable and so they tend to get flustered whenever things don’t turn out the way that they expect them to. Libra (September 23 – October 22) Your Libra man is typically a very nice and amiable guy. He tends to always project an air of confidence about him that a lot of people are drawn to. However, he is also the biggest hypocrite that you know. He knows how to talk the talk, but he doesn’t necessarily walk the walk and it really bugs you about him. Scorpio (October 23 – November 22) It’s all about being on top for the Scorpio. He is a power-hungry human being and he will stop at nothing to achieve his dreams. He has a tendency to be absolutely ruthless in the pursuit of his dreams and it can be such a struggle to deal with him at times. You sometimes wish that he would be a little more sensitive and thoughtful. Sagittarius (November 23 – December 21) He craves attention like a true drama queen. Yes, he may come off as someone who is very interesting, deep, and charismatic, but it’s all just an act. They only want the spotlight. They are all about the flash, but there really isn’t any substance there. Capricorn (December 22 – January 20) They just care too much about what society thinks of them and how other people view them. You have to know that Capricorn men are avid social climbers and social status is very much important to them. They won’t place too much interest in how their relationship is functioning in the inside. They are more interested in how they present themselves to the public and you have to be prepared for that. Aquarius (January 21 – February 18) In an effort to come off as someone who is special, unique, and one-of-a-kind, an Aquarius man will always have a tendency to force things that are beyond the scope of his personality. He is going to want to act a certain way in an effort to come across as someone who is interesting and eccentric even though he’s being totally fake about it. Pisces (February 19 – March 20) It pays off to be sentimental in a lot of occasions. You like how your boyfriend is sensitive and deeply in touch with his emotions. However, it can also be really annoying. They have a heavily inclined to overdo their sentimental tendencies and it can really get on peoples’ nerves. They attach too much meaning to simple things even though there’s no reason to do so.